With the Oscar’s this Sunday and wedding season right around the corner, it’s time to book your next brow appointment! Keeping my brows clean and defined is definitely a chore for me, simply because my hair is so light and I have a lot of it. I want them to look perfect, especially since emphasis on thick, manicured brows is such a big beauty trend! Since I wasn’t born with Cara Delevingne’s brows (sigh), I have to go to the professionals to keep mine looking pretty. For a while, I was just having my brows done at my favorite nail place – that is until the wax began ripping off my skin. Clearly not the right way to go! I recently started going to European Wax Center to get my brows and bikini line done. I figured if waxing is their specialty, they’ve gotta be good at it right? Well, they are amazing. It’s nearly painless (I’m a wuss, so that’s saying something) and fast – just what you want out of a wax. This Saturday (the 21st!) 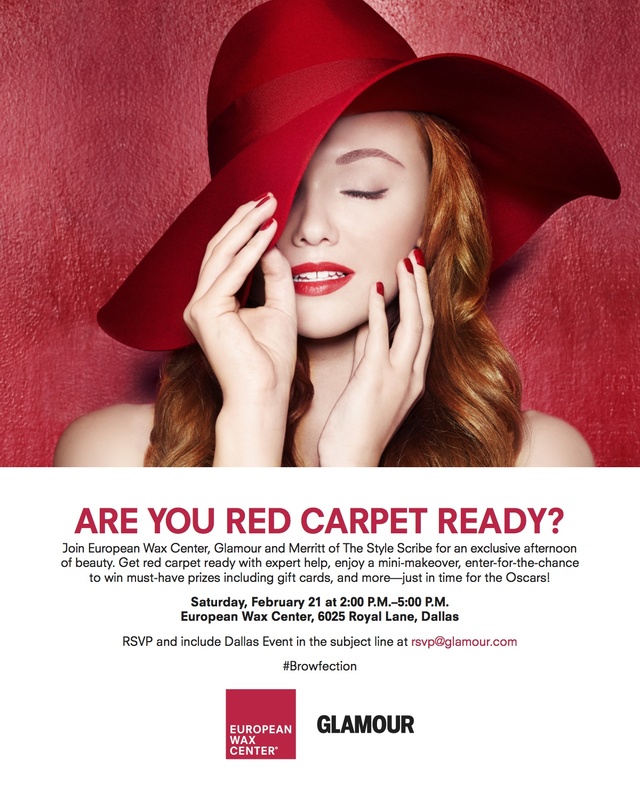 I’ll be hosting a super fun beauty event with Glamour Magazine at the European Wax Center in Preston Royal Village shopping center in Dallas! Come by between 2pm-5pm for brow treatments, mini-makeovers, sips + sweets and some awesome giveaways! If you plan to stop by, please be sure to RSVP by emailing RSVP@glamour.com with Dallas Event in the subject line. Hope to see all of you there!!! Sounds like an awesome event!!Congrats! What a great event! Wish I was closer! Sounds like fun! I’m a client of EWC. Wish I was in D Town.